Society portrays self-confidence and body-confidence very inaccurately. If a woman appears bubbly, positive and upbeat, she is automatically assumed to be confident in her skin. If she dresses a certain way and has the “perfect body,” she is deemed acceptable. But the truth is that you can look great on the outside and still feel insecure. We hear that confidence is key in everything. But what does being confident actually mean? When I was growing up, I wasn’t considered very confident. In fact, I struggled to love my body, the reflection I saw in the mirror and the clothes I put on my body. I was emotionally bullied about my weight by peers and friends, and it definitely took a toll on me. Insults and nasty comments were often disguised in jokes, and every comment took a jab at my confidence causing it to spiral down. I relied on other people’s perception of me to define my value. I finally came to a point where I’d had enough, and I was ready to discover who I really was. I knew there was more to life than this. Unfortunately, body-confidence isn’t something that comes in an instant. It’s not like you can say “I’m going to be confident about my body tomorrow,” go to sleep and wake up without the doubt and insecurity. Nothing in life is that easy. Body-confidence is an internal thing - a state of mind. As women, it’s a battle we face every day. We have to choose to see ourselves beyond the unattainable standards. We are beautiful, smart, confident, radiating with charm and grace, oozing with creativity and crowned in honor. 1| Own and embrace your own style. I realize this may sound a bit odd. It’s definitely not a normal tip you find in the average “How to be more confident” blog post. But I want to let you in on this secret because it was one of the things I held onto in my body-confidence journey. People could pick on my weight, how skinny my legs were and my overall appearance, but I got to choose my style. I got to use fashion as a creative outlet, and it actually helped to boost my confidence. If you’re not a stylist, I recommend finding a friend who is willing to help you or hopping onto Pinterest and finding pieces that flatter your body-type. 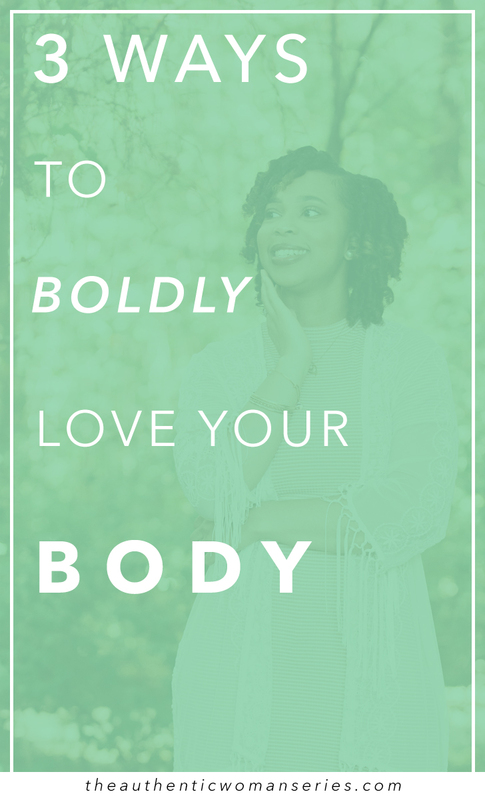 You’d be surprised by how much your confidence will sky-rocket when you wear things specifically for your body-type. Owning your own style isn’t just for the fashion savvy or style conscious individual. Creating and owning your style gives you a voice. It’s a way to declare your confidence without saying a word - a way to feel bold in your own skin and even inspire others. 2| Kill the negative self-talk and speak positively. It’s easy to fall into the rabbit-hole of negative self-talk. We tear ourselves down, one word after another, layer by layer, we tear down our confidence. “I’m so clumsy. I’m ugly. I’ll never be able to get this right. I never win anything.” We’ve all done this before. I’m guilty myself. But when we use remarks like this as a foundation of our identity, we are setting ourselves up for failure. What we don’t realize in the moment is that these words are so powerful. They have the ability to make or break us. But when you speak to yourself with affirming truths by declaring who you are, who you were created to be and the purpose you walk in, these words inject a new hope and glow into our beings. They create a new, strong foundation where we can be happy, joyful, authentic, stress-free and bold. Create some positive affirmations for yourself. As you look in the mirror, put on your clothes for the day, and as you wake up in the morning, recite them. “I am beautiful just the way I am.” If you’re doubtful about this process, do me a favor and just give it a try. You may be surprised at how positively impacted you will be. 3| Change your perspective. Accept yourself. Every time we focus on our weaknesses, failure, and insecurity we chip away at our confidence. When we focus on our struggle, we are forced to be insecure and doubtful of ourselves… But have you ever thought about what would happen if you looked at your strengths, beauty, and victories? Focus on your strengths. Accept the compliments. Recognize all of your achievements. Often, we are our own worst critic. So, when we decide to shift our focus and find a new perspective, we not only celebrate ourselves and inspire others, but we SHINE. So, I’ve said what being confident means to me, but what does confidence mean to you? I’d love to know your thoughts… Drop them in the comments below! Harriet Chunu, known by her friends as Harriee is an introvert, style and art driven girl with a heart for sour skittles and inspiring the lives of those around her. Find Harriee over on her blog, Instagram and Twitter and share some love!